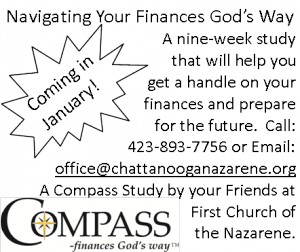 Adult Elective: This class uses topical studies provided by Nazarene Publishing House. es. This inductive Bible study method is a great model for personal Bible study. Antique Ladies (Mrs. Kathleen Young): This class uses the "quarterly" Bible study curriculum provided by Nazarene Publishing House. This includes a daily devotional book for intersted students. Evening Worship: Rev. Carlton Espy leads this traditional worship and preaching service. Choir Practice: Mr. Rick Derryberry leads our choir practice and devotional time. Small Groups: We are in the process of developing a small group ministry. Pastor Eric offers a group setting at the church. Additional home-based groups will be listed as they become available. Prayer Meeting: Pastor Eric leads this traditional worship and preaching service. Men's Small Group: Various teachers lead this men's Bible/Fellowship group. Women's Small Group: Various teachers lead this women's Bible/Fellowship group.